How Many Calories Are in One Tablespoon of Sunflower Seeds? While zinc might not be the most well-known of the vitamins and minerals, it's essential in the diet. Zinc plays an important role in wound healing, immunity, neurological function, and growth and development. A daily intake of zinc is needed to maintain a steady state because the body does not store zinc. The recommended dietary allowance for zinc is 11 mg for men and 8 mg for women. Eat more oysters. Oysters contain more zinc per serving than any other food. 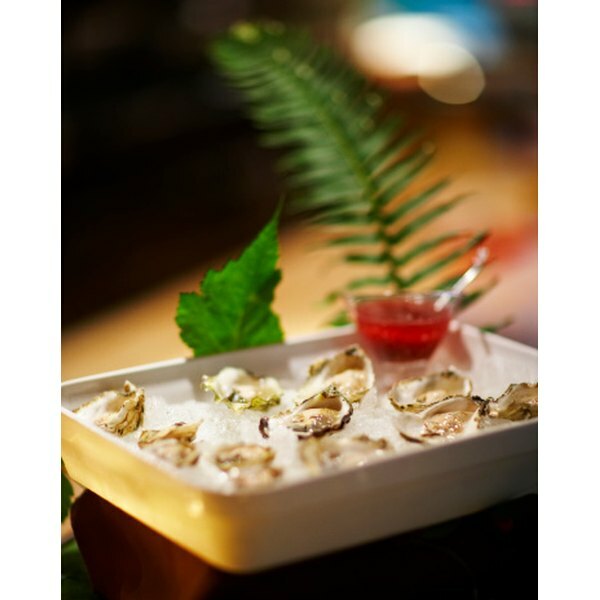 Six medium cooked oysters contain about 76 mg of zinc, depending on the variety. Eat more red meat. Red meat provides the majority of zinc in the American diet. Three oz. of cooked beef shanks provide 9 mg of zinc. Add wheat germ to your diet. Wheat germ contains 3.5 mg of zinc per 1/4 cup. It is found in a jar in the cereal aisle of the grocery store. Add to hot or cold cereal or bread and muffin recipes. Snack on seeds. An ounce of pumpkin seeds or sesame seeds contains 2 mg of zinc. Eat them roasted and salted, add to trail mix, or sprinkle on food before serving. Plant sources of zinc aren't absorbed as well as animal sources, so increase intake of plant foods high in zinc if you follow a vegetarian diet. The tolerable upper intake level for zinc is 40 mg for both men and women. Effects of high zinc intake include nausea, vomiting, loss of appetite, abdominal cramps, diarrhea and headaches. Long-term intakes above the UL increase the risk of adverse health effects so enjoy oysters sparingly. Nicole Ferring Holovach is a Maryland-based registered dietitian who has been writing health-related articles since 2007. Her writing has been featured in “Prevention” and “Today’s Dietitian” magazines. She received her bachelor’s degree in journalism from Syracuse University and her master’s degree in nutrition communication from Tufts University.